Charles Bernard Gara was born in Ossett on the 14th October 1885, the second child and eldest son of Irish born labourer Bernard Gara and his Wakefield born wife Mary Nancy (nee Murray), who married in December 1881 in the Dewsbury Roman Catholic Chapel. In 1891, Bernard and Mary Gara were living on Victoria Street, Ossett with four children, including Charles Bernard. By 1900 they had six children and in the late 1890s they had moved to New Street, Wakefield where in 1901 Bernard was working as an Innkeeper. In 1911, Bernard and Mary Gara had been married for 29 years and had twelve children, but sadly four had died before April 1911. In that year they had four of their children, including Charles Bernard living with them at 38, Providence Street, Wakefield. Both Bernard and his son Charles were working as pit sinkers. Charles Bernard Gara’s army service record has not survived, but it is known that he enlisted at Wakefield in the Kings Own Yorkshire Light Infantry with regimental service number 15346. He later transferred to the 10th (Service) Battalion of the York and Lancaster Regiment with service number 19751. The 10th (Service) Battalion, York & Lancaster Regiment was raised at Pontefract in September 1914 as part of Kitchener's Third Army and joined 63rd Brigade in 21st Division. After initial training close to home they moved to Halton Park, spending the winter in billets in Leighton Buzzard from December. They moved to Tring in May 1915 then to Witley in August for final training. They proceeded to France on the 11th of September 1915, landing at Boulogne. The Division embarked on lengthy marches and went into action in the British assault at Loos on 26 September, where the Division suffered over 3,800 casualties. In 1916 they were in action in The Battle of The Somme and on the 8th of July 1916 the battalion transferred with 63rd Brigade to 37th Division. In 1917 the took part in the Arras Offensive and the Third Battle of Ypres. In early 1918 the army was reorganised and on the 4th of February the 10th Yorks and Lancs was disbanded in France, with the troops transferring to other units. At some earlier stage in 1915, Private Gara transferred from the 15th (Service) Battalion, York and Lancaster Regiment to the 10th Battalion and was killed in action on the 3rd July 1916 in action north of Fricourt, at the Battle of the Somme. Charles Gara had embarked for France on the 10th September 1915 and consequently was posthumously awarded the 1914/15 Star in addition to the British and Victory medals. He is not remembered on any Ossett Memorial or Roll of Honour probably because he and his family left Ossett in the mid 1890s He is remembered in this 2014 biography and Roll of Honour because the Commonwealth War Graves Commission and/or the U.K. Soldiers who Died in the Great War 1914-1918 listing records him as born or residing in Ossett. 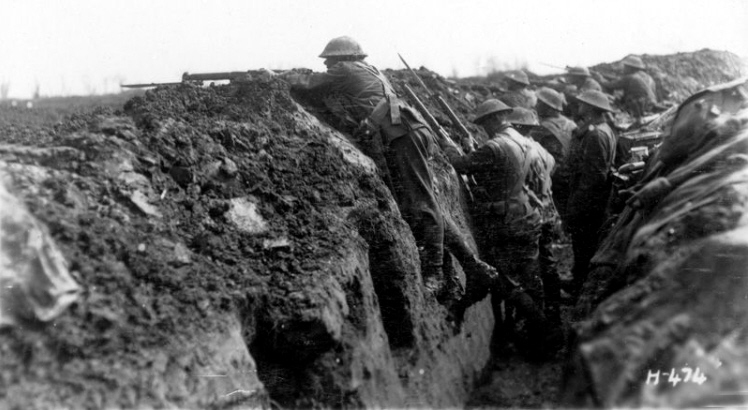 Above: British troops in trenches at the Battle of the Somme in 1916. Private Charles B. Gara died on the 3rd July 1916, aged 31 years and is remembered on Pier and Face 14A and 14B at the Thiepval Memorial,1 Somme, France. The Thiepval Memorial will be found on the D73, next to the village of Thiepval, off the main Bapaume to Albert road (D929). Each year a major ceremony is held at the memorial on 1 July.